On Sunday, wet snow fell for most of the early morning, switching over the rain before I left to go riding at about 10 a.m. The roads hadn't been plowed and were covered with about three inches of sludge. I tried to ride in the shoulder, but I could never make it more than three or four feet before the rear wheel slipped or spun out. I tried the sidewalk with the same results. The only place I could make the bike move forward was the narrow strip of wet pavement where the snow had been pushed aside by cars - and that was where all the cars were slipping and spinning and barreling through. Riding the road seemed suicidal, so I turned around with a plan to ride loops on the trails near my house. I managed about three miles with mostly the same results - slipping and skidding and washing out. I might as well have been riding in bacon grease. I was bummed, because I was really hoping to get in a long ride on Sunday. But I just couldn't ride. The conditions made it nearly impossible. It sounds kind of funny, but I really believe that bacon grease snow is probably one of the few normal weather conditions that truly prevent cycling. If I had to commute to work that day, I would have had to walk. I'm curious if other all-weather cyclists out there have found similarly impossible conditions (not including extreme weather, like hurricanes and blizzards.) Studs wouldn't have helped because there was no ice. Skinnier tires might have cut through the snow better, but that seemed too risky when everything was so slippery already. No, the bike riding just wasn't going to happen. Of this I'm convinced. What kind of impossible conditions have you run into, and how do you deal with them? I ride year-round in Milwaukee and find similar conditions at the beginning of each winter season. For the last couple of years, I always have one big crash the first week of snow because 1) I'm riding too fast (have to slow down for the conditions) and 2) I have to remember how to ride in wet snow. I've just accepted the fact that I have that big crash and keep riding, knowing that the temperature will drop and the snow will get better. So, I don't have much to offer you other than a bit of empathy. I'd have to agree bacon grease snow is the most difficult. Luckily my route to work is lightly traveled by car. I find skinny studded tires(700 x 35c tires, some would not call these skinny, but they are compared to the Endomorphs)work best. I ride in the car tracks. And venture into the the bacon grease on the shoulder when cars come by. I definitely plan on falling once or twice. If I had to ride on heavily traveled roads, I'd never make it to work. It has been a while since I have ridden all year round, however, I remember that ice with an inch or so of dusty snow on top was always dangerous. The snow makes the ice very slippery and you aren't even aware there is ice there until your bike slips out from undeneath you and you end up licking the street like a popcicle. Getting off of my couch is my most challenging ride condition. Bike tire chains should work better than studs in deep wet snow. It's been so long since I've lived in a place with a real winter. Though a little east of here there was a short burst of flurries yesterday. I'd think narrower tires would cut through the slop the best. I commute year round in Central Washington state. Two challenging situations come to mind. The first was several years ago around this time of year. It was somewhat cool all day with a steady rain. Just after sunset, it cleared up and the temperature started to drop. I have a 10 mile commute home and gain about 600 ft of elevation. You probably can guess where this is going. Still riding the road bike at the time, all of the sudden it felt like I was losing air out of the back tire. You guessed it, black ice. Fortunatly there wern't many cars out. I could ride the straights but had to walk the banked corners. I went to what I call the Tractor the next day, mountain bike with studs. The other condition is sub zero where they have decided to use salt solution to melt snow with no luck. Side roads with 6" of sugar on top of slippery blacktop. Pugsley might eat that stuff up but my 2" 26ers were no match. Fortunately, those types day are few and far between. Good lord, I'd consider 9/10 of what you ride in as "impossible conditions." I live/ride in Marquette, MI right on Lake Superior. During the winter, the bike trail is converted into a snowmobile trail and while the Endomorphs would be great for that section, I also have a few miles of roads to deal with. I think the ideal would be studded Endomorphs but I'm hesitant to drill into $100 tires with some cheezy sheet metal screws. Surly, Help! As it is, I ride a Surly Cross Check with studded tires... probably about 35mm wide. Except for the deep fluffy snow, they work great. 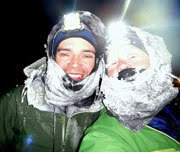 And despite our winters in the Upper Peninsula, I feel like I wimp most of the time when I read your blog. Thank you for the inspiration! Got an adorable fixie for commuting in central PA. With clipless pedals it was bliss. I wholeheartedly believed some guy who told me fixies were all-weather commuting machines, and so I headed out into the bacon grease wearing my ski helmet, ski goggles, and a fabulously immature attitude of invincibility. I actually made it downtown but wiped out right in the middle of the busiest intersection in State College. My goggles flew off my helmet and slid under a delivery truck. I tried to get up, but my cleats somehow weren't compatible with bacon grease on asphalt. I managed to completely block the intersection with my personal sprawl; it took one complete traffic light cycle and some very helpful angry honking to get my act together and crawl to the curb. Fortunately, two co-workers, my old Chemistry professor, and the guy who sells me coffee in the morning were able to witness the whole thing. BTW, I've been reading your blog faithfully for the last few months, Jill. Absolutely love it. Thanks. Freezing fog. The road looks like it is just wet. You might notice a glint of light off an ice crystal, under a street lamp perhaps. This usually just befor you go down. The hazard is amplified because it catches you off guard. I'd have to agree with fish. You teach me all the time that my ridding season could be much longer than I make it! weelll, since you asked, as for meezers, i just started mountain biking after years of road biking and found snow at 4000 this week. also, since it was the first snow of the season and the bears and other animals were not yet hunkered down-- i saw so many tracks! big cougar tracks! very active animals. i am guessing that i might just switch to skis when the snow gets too much. 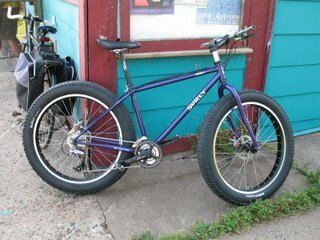 i cant afford a surly bike since i just bought a 29er. im guessing the widest tires i can fit will be 2.5 inches. but i will have to try more snow biking soon. 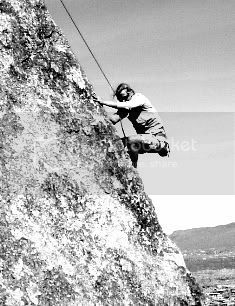 i imagine you cant really climb steep stuff though. cyclocross tires, or lightly treaded road tires work great. Most of the snow we get here is that greasy wet water packed slush. Never an issue with road tires or cross tires even when hauling a trailer up hills and what not. I find that 3:00 pm on a day when temps hit 120 impossible to ride in. You want to puke the minute you start riding anything that requires effort. Anything beyond 30 minutes is impossible without getting dizzy and/or getting the chills...(bad sign). Wind Jill, WIND! Especially those winter days when we have that steady 30 to 40 MPH and then the gust hit you 60 to 70 mph....put the bike away and walk. I never tackle the snow like you do and some of these other commuters. I salute those of you that do! Most of the year bike commuting in Albuquerque is relatively sweet. However goatheads are the nemesis of all cyclists here, and this is one of the worse seasons of the year for them. Heavy duty Specialized brand Armadillo tires and tubes with sealant get me through a few thousand flat-free miles. By the time my tires start flating out I usually have a several dozen punctures, and the sealant just cannot keep up anymore. It is cheaper to replace the tube, than to patch it. There are several miles of pedestrian/bike path I travel at o'dark thirty in the morning that run against the oncoming traffic. The headlights of the oncoming vehicles wash out my vision. I have three halogen lights (50 watts total) and that helps me to maintain my vision in these conditions. The two other special features of the Southwest are deep sand and adobe mud. Either extreme will stop you in your tracks. A Pugsley could easily handle the sand, but any bike will look like a Pugsley after a few feet of wet adobe mud. Usually the deep sand occurs in stretches not longer than a hundred yards or so. I just hike-a-bike through it. However, the adobe mud is utterly and brutally hopeless. Just stop and make camp. Wait it out, because you aren't going too far or very fast. You might as well save your energy until it drys out and firms back up. Although I have been slacking on my my blog lately I do have posts and pictures on all these situations except for the sand traps. The best solution for all these problems is a good attitude. Try to laugh about it, and don't let it bother you. Besides, the challenges, make the average days feel terrific. knobby w/ low pressure, c'mon you already know this ! Um, MOST of the conditions you ride in seem impossible to me. I'm a wuss. I don't ride in snow or ice of any kind or extreme cold. I don't ride when there is lightning. I can ride in triple digit temps and 30 mph wind, but that's nothing compared to what you do. I think gewilli is right. For riding on the road in those kinds of condtions, studded cyclocross tires would be the way to go. (In case there were patches of ice under the snow.) That way you could slice through to the pavement, most of the time. I still don't know that those would have worked for me. Some better cyclists, maybe, would have success with skinny tires, but I would have had a really hard time staying upright in three to five inches of thick, slippery sludge that had been pushed around in uneven piles by cars. As it was, I could not get any traction with my fat tires. The back wheel just spun out. It would have been a great stationary workout if I could have kept my balance. I appreciate the "we can conquer anything" attitude of some commuting cyclists. But I really think that sometimes the bicycle just isn't the appropriate machine for some conditons. I of all people should have learned this by now. I also am in the camp that would love to see studded Endos. They would be so heavy, but so sweet for downhill snowbiking, which is a developing love of mine given all the steep and icy terrain we have here in Juneau. My Endomorphs are pretty worn, so I might look into inserting some studs into my old pair when I get new ones. though well worth it for me as the most consistent ride conditions are packed demi ice for several weeks.